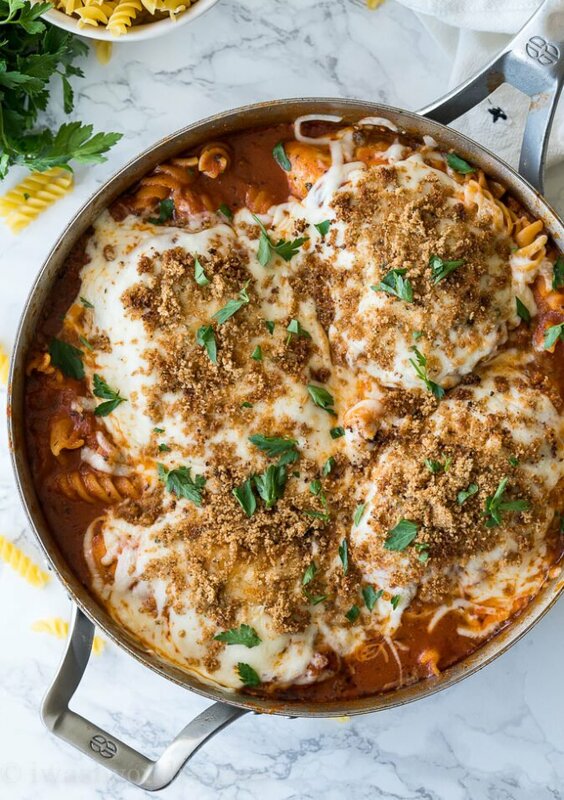 This One Skillet Chicken Parmesan Pasta is filled with tender, cheesy pasta and juicy chicken all made in the same pan! 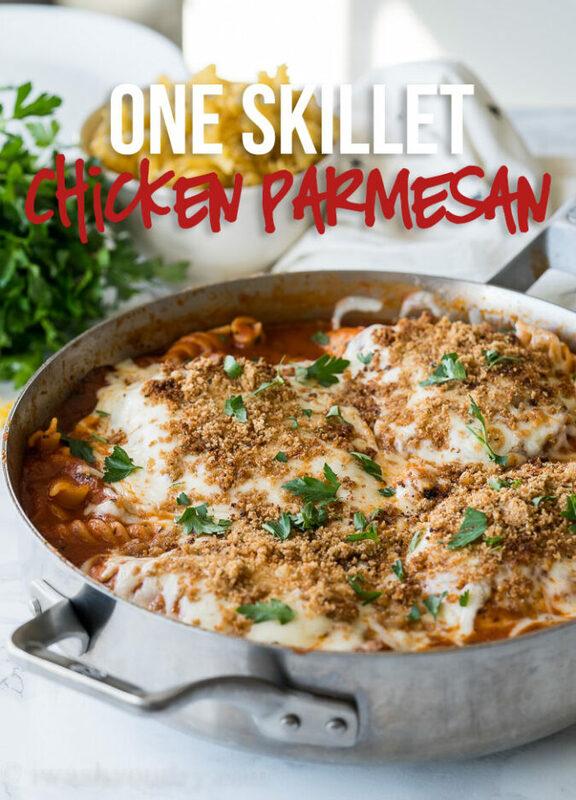 You know I couldn’t resist sharing another one skillet dinner recipe with you, right? I sincerely feel like it’s my duty to bring you quick and easy recipes that use as few dishes as possible, so naturally one skillet dinner recipes are my forte. Let’s talk about chicken for a hot minute. 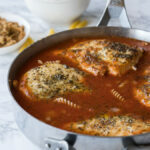 I’m kind of a fanatic about making sure all of my chicken recipes are PACKED with flavor, but most of all, that the chicken is juicy and tender. BUT HOW?? There are a few tricks you need to know in order to get successful results 100% of the time – trust me on this. Pound the Chicken! I’m sure you’ve noticed that chicken breasts tend to have a teardrop shape with a more plump side versus a skinnier, thinner side. In order to cook the chicken evenly (and avoid dried out chicken) it’s crucial to use a heavy mallet or sturdy rolling pin to pound the chicken to an even thickness. Sear the Chicken! A lot of my chicken recipes start with searing the chicken first in a hot oiled skillet. A LOT OF YOU want to skip this step and toss it straight into the oven. You’re missing out on major flavor by skipping this crucial step. DON’T SKIP IT. Searing the chicken will lock in the juices and create a “crust” if you will, that will help to keep the chicken very moist. I said it. MOIST. Deal with it. Don’t Move the Chicken! 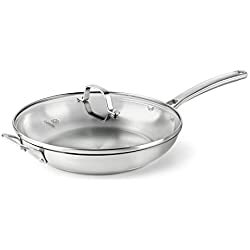 Speaking of searing the chicken, have you ever tried to move your chicken in the skillet and OH NO! it’s stuck! Now there are pieces of chicken stuck to the skillet and your chicken is mutilated and def. not instagram worthy. Did you know that the reason this happened is because your chicken was not seared all the way yet. Slightly nudge the chicken rather than trying to rip it free of the skillet, if it moves freely you’re golden. If not, give it a little more time. It’ll release from the pan when it’s ready! Tent the Chicken! No we’re not taking the chicken camping, we’re creating a steam pocket and letting our chicken chill for a few minutes so they have a moment to redistribute the juices locked inside. Place your seared chicken on a plate and loosely cover with aluminum foil for at least 3 to 5 minutes. 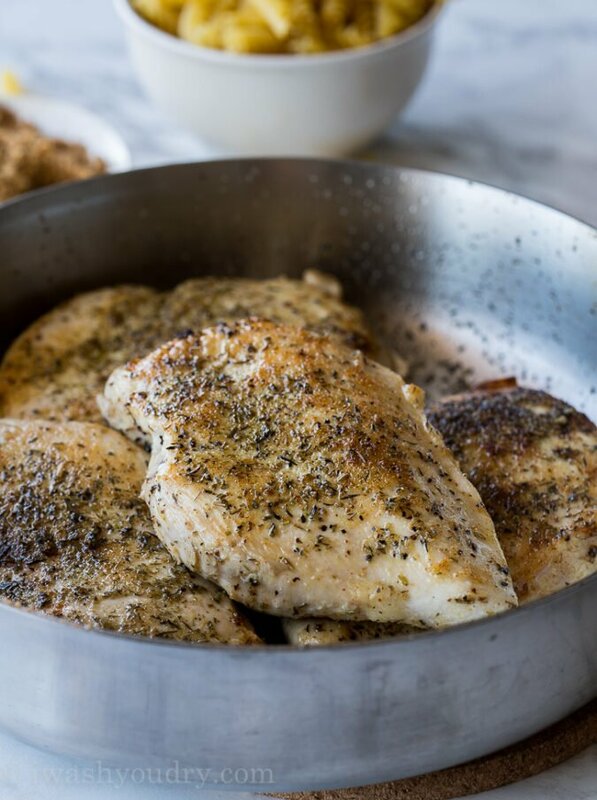 You’ll be shocked at how these simple steps will result in the BEST chicken 100% of the time. Promise. Ok, I got off on a tangent there with the chicken, so let’s bring it back to the dish at hand. 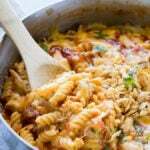 What I love most about this recipe is that the pasta is cooked in the sauce WITH the chicken! 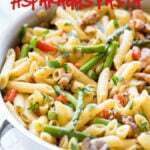 It’s an all-in-one winning dish that even my kids loved. I mean, what’s not to love here?! There’s no dipping chicken in flour, eggs and breadcrumbs. It’s a naked Chicken Parmesan, but I couldn’t let go of the idea of breadcrumbs completely so I did sprinkle some toasted breadcrumbs on top when it was done cooking. 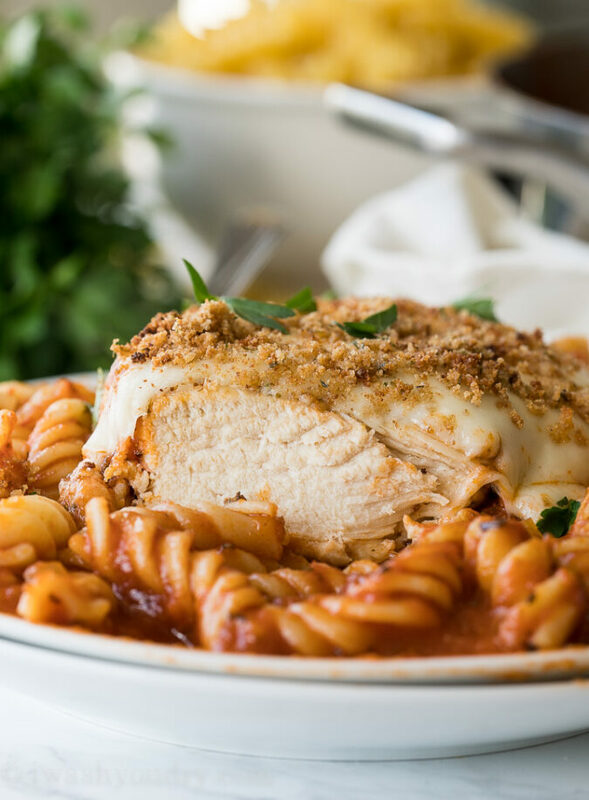 The tender pasta is cooked in a the pasta sauce for optimal flavor, while the chicken is moist and juicy, plus a hefty layer of mozzarella and parmesan cheese are never a bad idea. 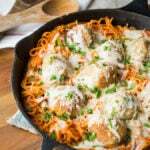 All and all my kids gave this one skillet dinner two enthusiastic thumbs up. 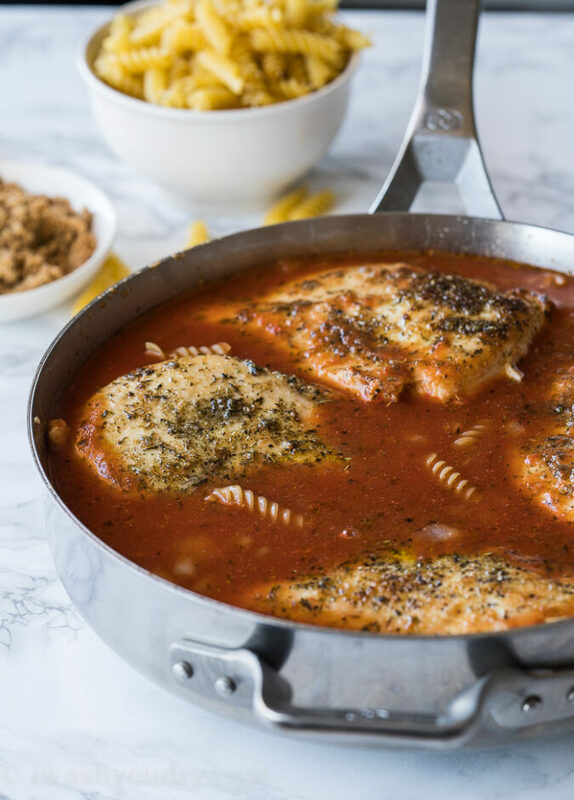 This saucy One Skillet Chicken Parmesan with Pasta is a complete meal prepped and cooked in just one pan! Definitely a new family favorite! In a large skillet melt the butter over medium heat then toss in the bread crumbs. Stir until the bread crumbs are toasted and then remove from the skillet to a small dish and set aside for later. Wipe out the skillet with a paper towel and return to the stove top. Add 2 tbsp of olive oil over medium high heat. Season the chicken breasts with the Italian seasoning, garlic powder and salt. Sear the chicken breasts in the olive oil for 2 to 3 minutes per side and remove from skillet to a clean plate. Add 1 tbsp of olive oil to the empty skillet and saute the onion and garlic until tender, about 3 minutes. Add in the uncooked pasta, pasta sauce and 1 cup of water. Stir and bring to a boil. Carefully place the chicken breasts on top of the pasta and reduce heat to medium low, then cover. Let cook until pasta is tender about 15 to 18 minutes. Remove the lid and gently stir the pasta around. Mixture should still be fairly saucy. 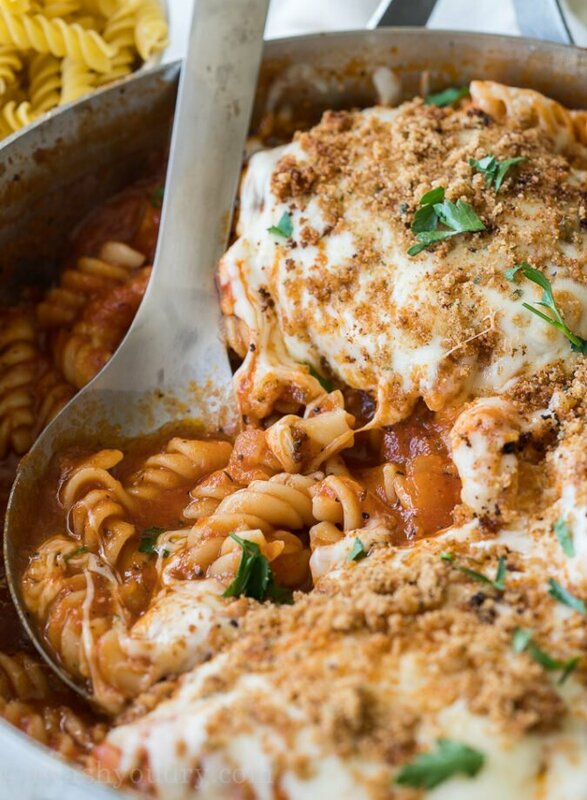 Cover the chicken breasts with the mozzarella and parmesan cheese then place the lid back over the top to let the cheese melt. If desired, place the skillet (without the lid on) under the broiler in your oven for a minute or two to brown the cheese. Finally, sprinkle the top of each chicken breast with the toasted breadcrumbs and chopped parsley. Enjoy! You can omit the toasted breadcrumbs if you’re not interested in using them. 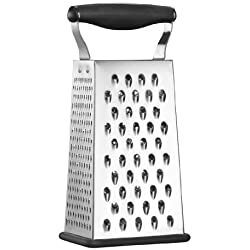 You can also use any sort of small pasta in place of the rotini. Well, I’m new here but looking forward to giving this a shot. 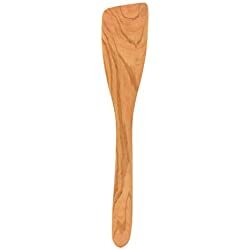 I’m married to an Italian so that will be the real test.